This is my crystal chandy. As I’ve shared before, this was the first birthday gift given to me by Mr. OTN in our first home together. So while I love it “as is”, I find it fun to change it up a bit with the seasons (my favorite was my Christmas Chandy which you can view HERE). 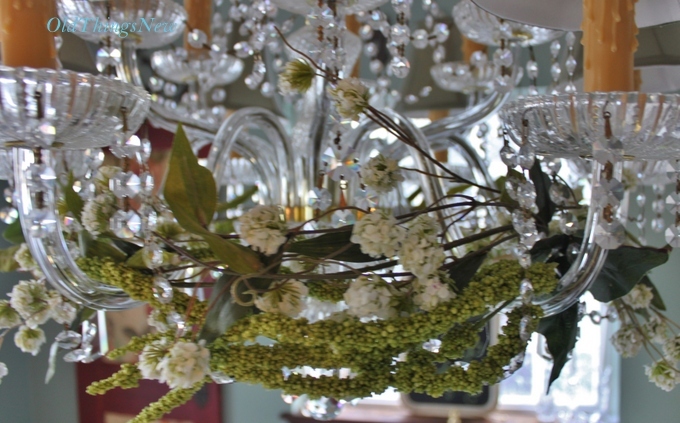 To usher in the warmer weather I’ve created a Spring wreath (of sorts) for my chandy, with flowers purchased at the L.A. Flower market (to read more about the market and see the amazing flowers you can link back HERE). 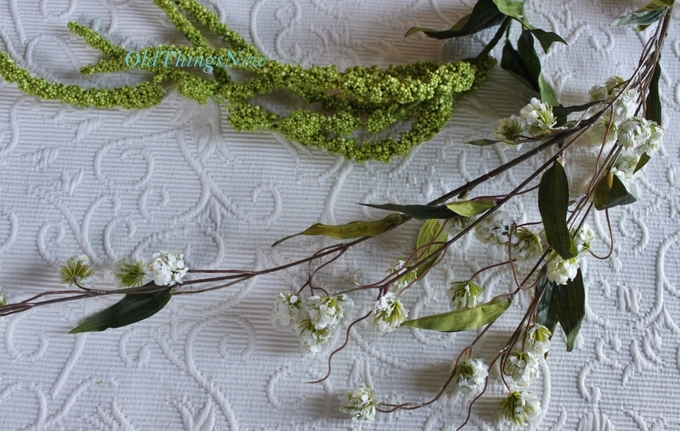 I began with two different types of flowering branches. I have no idea what these flowers are called though I wish I did. Does anyone know what they might be? 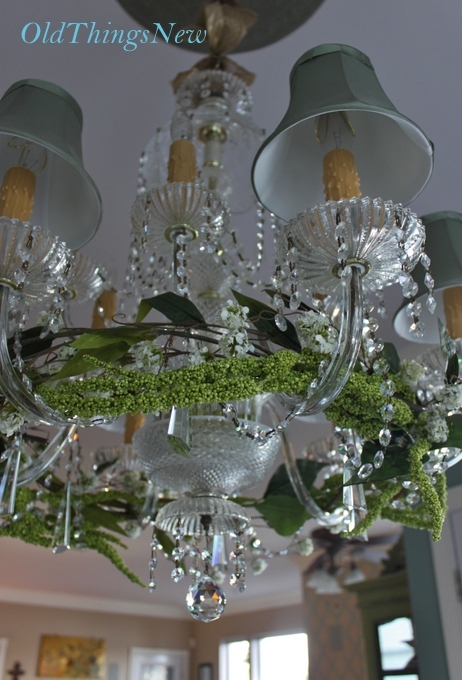 I laid down three of these pretty green branches first, across the arms of the chandelier. 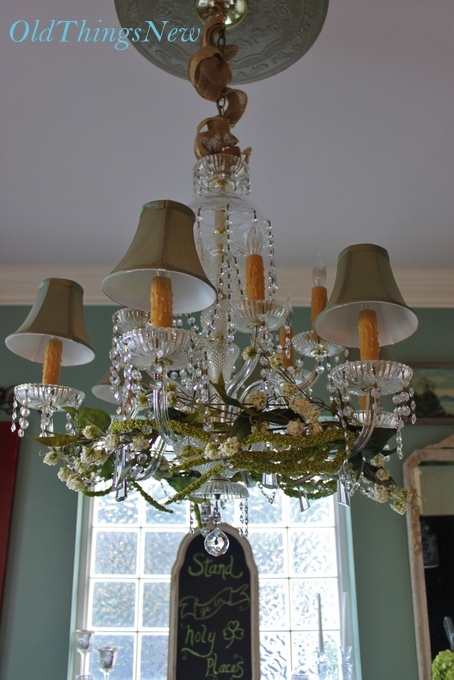 Then I placed three of the white flowering branches on top. After a little twisting (to connect the ends of the branches together) and a little tucking (to hide the bare ends and the wires) . . .
. . . VOILA! A Spring wreath for my chandy! You can see in this picture that it is another sunny day on the lake, for a few minutes anyway. This time of year the weather is so unpredictable and it has been sunny . . . rainy . . . cloudy . . . sunny all day. The shining sun causes the crystals to send off rainbows of color all around the room. Be still my beating heart! So that’s it. A Spring Wreath for my Chandy. It was fun decorating her for Spring but I’m already thinking ahead and wondering what her summer decor will be. Shells perhaps? « The L.A. Flower Market! 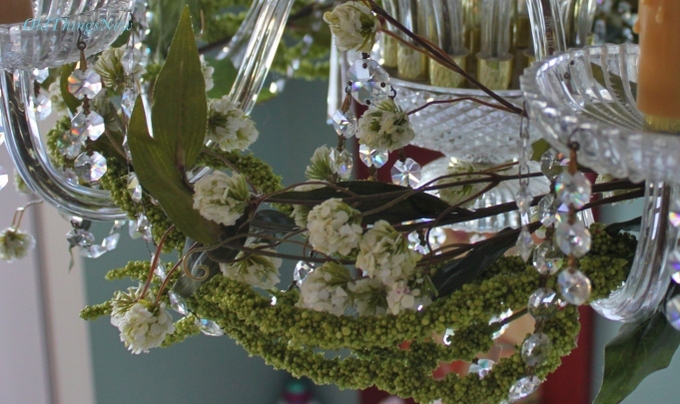 The wreath looks lovely on your chandelier – I think the flower might be clover. It’s what I remember seeing out in the fields on my grandparents farm when I was a young child. 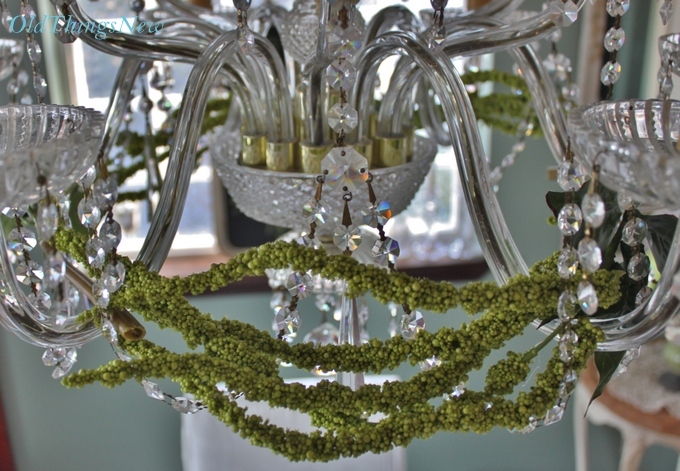 Your chandelier shines with radiant light from within! 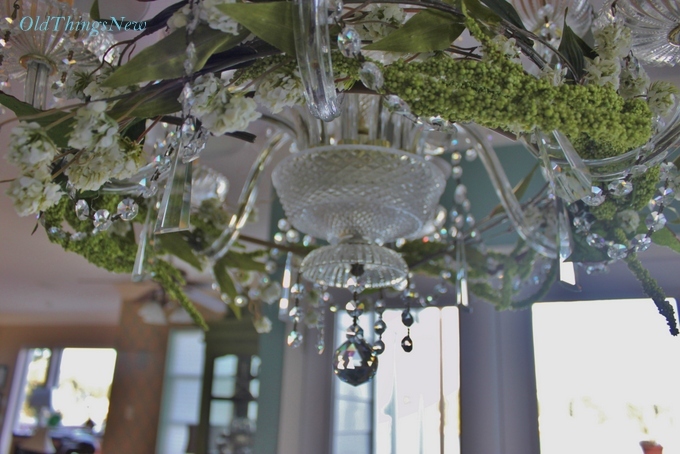 The addition of the green & white florals herald Springs arrival “In Style”!!! 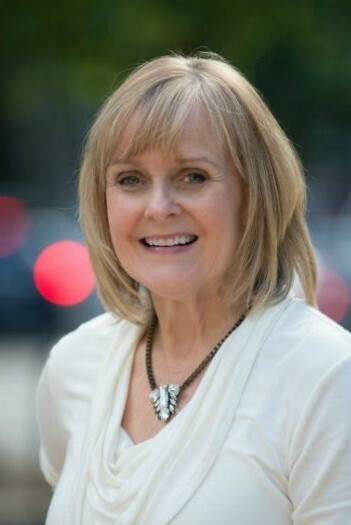 Thanks for the shout out on your blog….how cool to be blog of the week! Love the new look of your blog! Also love the dressed up chandelier! It looks wonderful! Thanx for sharing at THT. Patti, thanks for stopping by Finding Fabulous the other day! 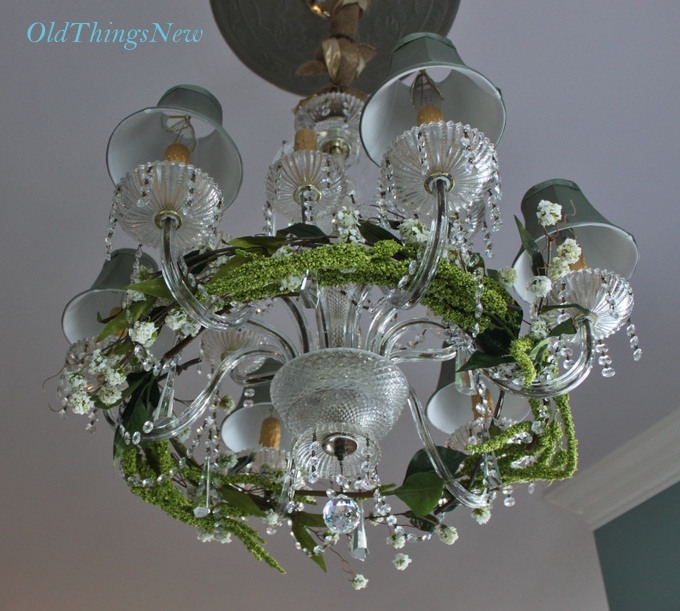 Your chandy is so chic and Springy. Thanks for sharing!! Perfect touch for Spring Patti. Your chandy is gorgeous too! Thanks for sharing with SYC. So pretty. Thanks so much for sharing with Adorned From Above’s Link Party. That looks really pretty! 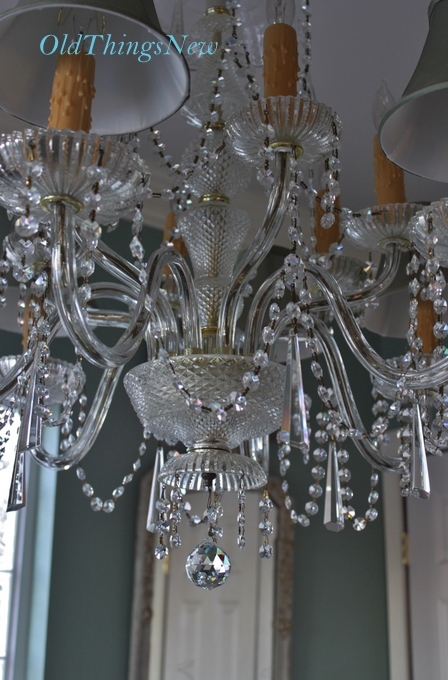 Your chandelier is beautiful- what a nice gift from Mr. OTN. I’ve decorated mine at Christmas with a wreath I attached to the bottom side and decorated but I haven’t done one sort of “free form” . I like how yours turned out- perfect for spring! This is lovely!! 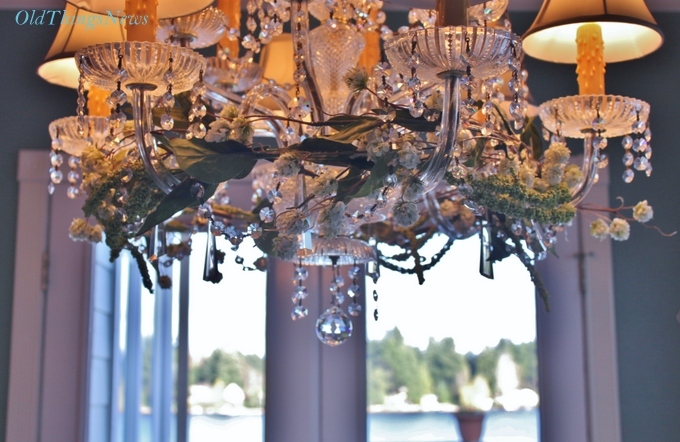 I, also, went back to look at your chandelier decorated for Christmas – so creative. 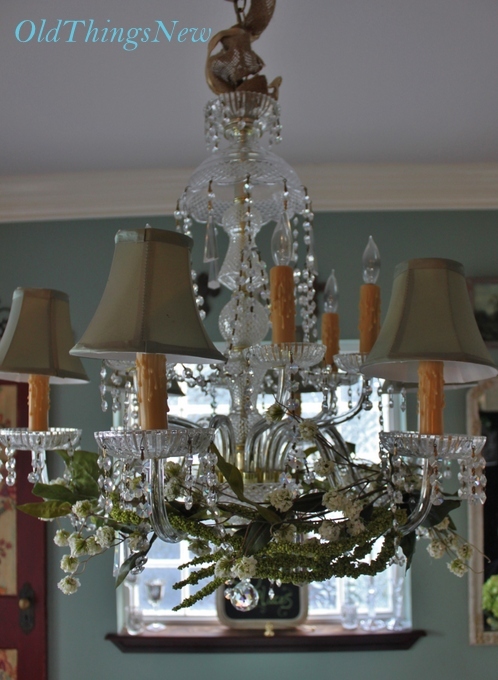 Sorry, this note is so short, but I am headed to my dining room to figure out what I can do to my chandelier – lol!!! This is so pretty! It should be in a magazine!!! Oh how pretty Patti! I am so craving green right now! This is such a beautiful idea! I just wanted to let you know that I am linking to this post on 4/7 at Simply Creative Living if you don’t mind.